St. Croix Concrete’ stamped concrete services is a less expensive alternative to other natural building materials such as stone, slate or brick. In addition to the cost benefits, stamped concrete is also more durable, longer lasting and customizable to deliver any stamped pattern and color(s). 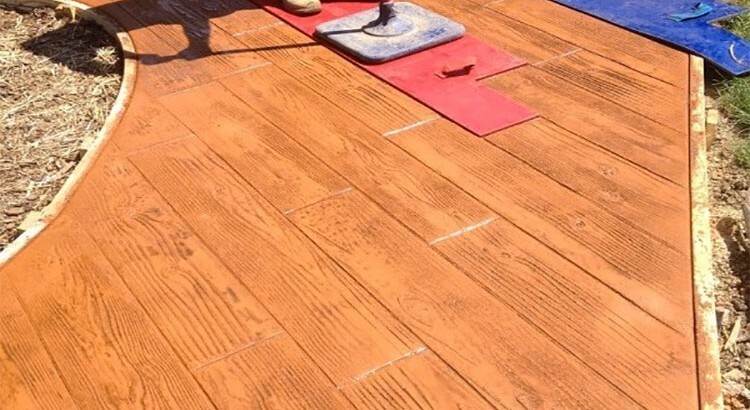 Our professional stamped concrete solutions resemble brick, slate, flagstone, worn rock or stone, tile, wood and many other patterns and textures, and are commonly used for patios, sidewalks, driveways, pool decks and interior flooring. 1. The addition of liquid base color to the concrete mix – The base color is the main color used in stamped concrete and is selected to reflect the color of the natural building surroundings. 2. The addition of accent color hardener release – The accent color is the secondary color used in stamped concrete. The secondary accent color release serves two purposes. One, additional pigment used to color and produce added texture and two, color release is a non-adhesive used to prevent the concrete stamps from sticking to the concrete. 3. Stamping a pattern or texture into the concrete – The pattern is made by imprinting the surface of the concrete with a specialty designed stamp shortly after the concrete has been poured. These three processes deliver a color and shape similar to other natural building materials, but at a cost that is far less. To view stamp patterns click Here. To view liquid color chart click Here. To view color hardener release chart click Here.